If you have a chance to go to Bach Long Vy island just don't miss it. It takes about 8 hours to reach the island of Bach Long Vi, the most remote, most difficult island in the Gulf of Tonkin must be an enjoyable experience. The first experience that visitors will have is...seasickness. Good advice for those who go to Bach Long Vi for the first time is to take the drug against seasick and then go to sleep until you reach the port of Bach Long Vi, the busiest place of the island, with hundreds of ships and boats anchoring each day. This port is also a change of Bach Long Vi, turning this place into a logistics service center between the Gulf of Tonkin. Next to the port on the left is a beautiful long sandy beach. Guests can organize fire camping, cultural exchanges, swimming, watching the sunset from here. However, in our opinion, the most interesting point in coming to Bach Long Vi is the seafood market. Early in the morning, when tourists are sleeping, local people go fishing. About 7.00 am, fishermen come back and sell seafood right in front of the Bach Long Vi residential area. Shrimp, squid, all kinds of fish, bamboo shoots, sea crabs...very fresh and cheap. In addition to dining, bathing, visitors can visit Bach Long Vi lighthouse on the top of the mountain, the lighthouse has been operating since 1995. 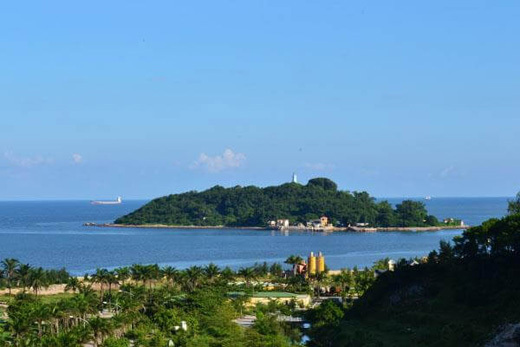 Standing on the lighthouse, visitors can enjoy panoramic view of the island named White Dragon. To make it easier for local people to travel to Bach Long Vi Island, Hai Phong authorities have recently organized tours to Bach Long Vy. At the moment only domestic tours are allowed on this tour.